Nikon Trailblazer 10×25 Review: Worth your hard earned money? The Nikon Trailblazer 10×25 ATB Binoculars are compact and durable. Manufactured to withstand the harshness of the great outdoors. A good choice for hunters, sports fans, and trailblazers. These ATB’s feature 10x magnification in 25mm objective lenses. This set of binoculars comes with everything you need for a basic set-up. More experienced users might want to consider an upgrade. The quality of these add-ons is definitely cheap. The neck strap is uncomfortable, the carrying case is dull, and the eyepiece covers are too tight. (When removing them, there is a risk of detaching the eye reliefs altogether.) The lens covers, in contrast, fit perfect. The basics: These binoculars feature Bak4 roof prisms and multi-coated lenses. They have an IPD of 56-72mm, which will accommodate most users well. The twist-up eye cups provide up to 10mm of eye relief. Enough to adjust for eyeglasses or sunglasses. Focus: The central focus knob is quite smooth and allows for quick viewing at a range of 11.5′ to as far as you need. I had an issue when removing the too-tight eyepiece covers. The diopter doesn’t lock, which leads to accidental adjustments. Field of view: These binoculars have a range of 1000 yards. Considering the compact lenses and 10x magnification, this is an impressive number. (6.5° angular field view, 342′ field of view.) This makes them great for scouting a location or watching a football game, as long as the light is good. Resilience: These binoculars offer decent protection from mold, fungus, and heat damage. They are 100% waterproof and fog-proof. Nitrogen-filled chambers and O-rings help keep the elements out, so you don’t have to worry about your equipment being damaged. Light: These binoculars perform well during daylight hours. In low light conditions, it is a different story. Their light gathering capacity is pretty low. (They have a relative brightness of only 6.3). Heavy cloud cover or any low light conditions will affect their clarity and contrast. This is one of the biggest drawbacks. The 25mm lenses just doesn’t have a large enough surface to gather all the light. But, how do they feel? They’re pretty light, actually. 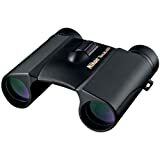 With a protective rubber-armor coating, these binoculars weigh in at just under 10 ounces. Unfortunately, they’ve got a closed-bridge design. This means you won’t be able to get a firm grip around the lenses when you try to keep it from banging against your chest. Ok, how durable are these bad boys? I was actually surprised to find that they’re close to indestructible with normal use. The coating keeps them protected, and helps you keep a good grip on them in damp and rainy conditions. (Considering the closed design, every little bit of grip helps.) Even with the rubbery grip, I have dropped them from a fair height on a couple of occasions. Looking at them you won’t be able to tell. I wouldn’t recommend them for bird watching. You won’t be able to appreciate the colors of your subjects. But for users looking to scout locations or watch the game from the cheap seats, these are a decent option. The Trailblazer’s normally retail for around $130. I would suggest you grab a pair if you see them advertised anywhere for under $100. You would be hard pressed to find a sub $100 binocular that is as durable. Can you identify this mystery buck? Features To Look For When Selecting Best Compact Binoculars ! Looking for Best Price on your Compact Binoculars? Copyright 2016 by The Binoculars Guy.